I don't have my dream sewing room yet, but I am well on my way. There has been no sewing here this weekend. 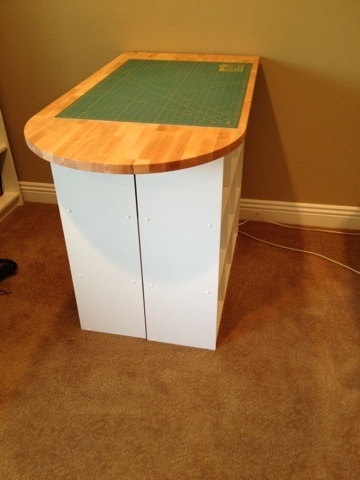 Instead, I have had a fun time building this cutting station for my sewing room. I originally saw @frecklemama's photo on Instagram and knew I wanted to make a cutting station like she had made. 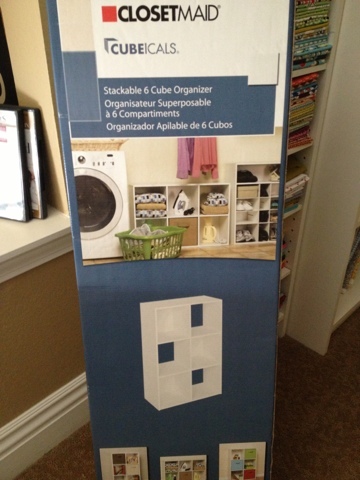 I started with 2 of these cube organizers from Target (European friends might be able to find them at Tesco). These things are sort of a pain to build, but luckily this one didn't have too many pieces. Two cube organizers, back to back and a table top from IKEA and I had a great cutting center. 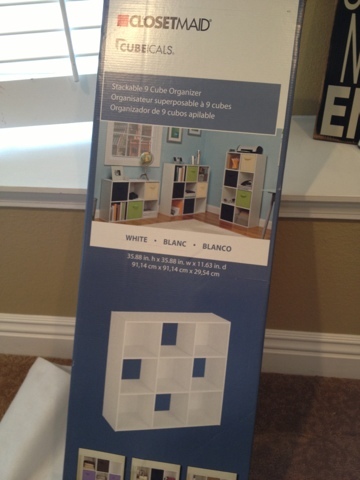 But there was still room under the tabletop so I went back to Target and bought the 6 unit cube organizer. Now I have 24 cubes to store lots of sewing supplies, books and scraps. I also got these fabric baskets to organize my scraps by color. I still need to get an orange and a yellow basket. I hope I can find them. Now to find the perfect paint color to paint the walls and brighten up this space. It's coming along and hopefully will be finished in the next few months. Wow, that's truly lovely! I think it looks like a perfect height too...I get back pain from my cutting table and it's not even super low. =( I don't have a sewing area to call my own, but it's fun to look at yours. Your organization is looking lovely. So happy for you. Great idea. I wonder if Gordon would mind one in the dining room! I love that! What is the height? I'm bookmarking this one! this is genius I love it! This is awesome!! Good for you! It is well on its way! Your cutting table is fabulous! Any ideas about paint colour? That’s looking good, what a wonderful idea! Looks great, and I love the coloured fabric baskets to match scraps! Your sewing room is beautiful! 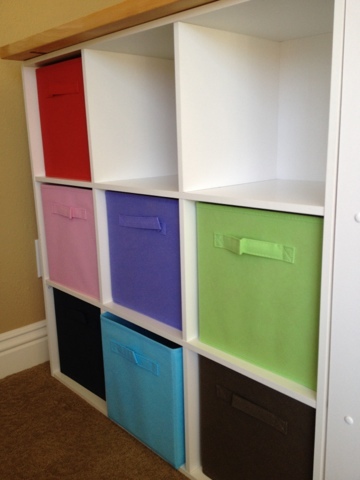 You have made great use of your space with all of the storage cubbies. This is great! I am excited to see your dream sewing room progress. Great idea and nice to have all that added storage! That is looking fabulous. I hope i have enough room in my new sewing room for a cutting station, and I love the idea of all that storage underneath- colour co-ordinated and everything-perfect! Jealous!!! It looks amazing Di - good for you - it will be even more of a pleasure now to enter your sewing space. I just painted my space Antique White.. and then saw someone elses space painted a greyish blue. I want their color now. UGH. But I don't really want to re-paint, so I will deal with my Antique White. I figured it would look great with whatever I hung on the wall. Love your cutting station. It looks so sturdy. 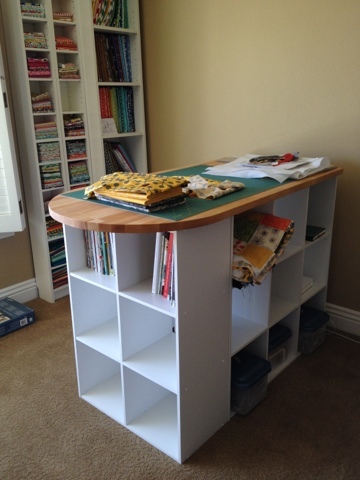 I really need to find myself the perfect sewing station. My table is just a foldout table, and it jumps as my machine sews. Not suitable at all, but I do have a huge room and I really appreciate that. Oh it looks brilliant - I am very jealous - if only Tesco was as good as Target! What a great space! You and Mr. R. did a fabulous job. WOW! This is going to be so amazing! Please show us more as you finish it off! This is such a brilliant idea - so much organised storage space too! Looks great Di! I bet it feels good to be organized. Your fabric looks great as well. This is so darned cool! How high is it from the floor? I like my cutting station to be about 35"-36". By the way, I found my white shelves at Home Depot for less than at Target. Love those canvas bins which were also a Home Depot purchase. I have them all in the same color (aqua) with labels on them to indicate colors of the scraps within them. My fabric chunks are in a tall, doored cabinet. It's fun to get organized, isn't it? 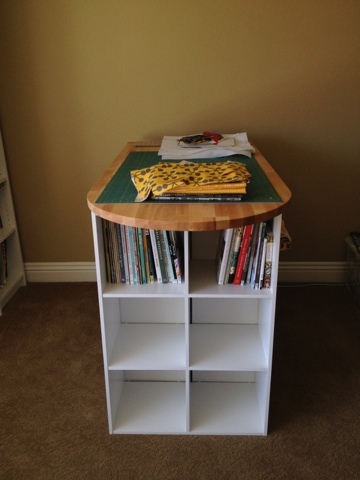 This is the best cutting table ever I want to make one of these so badly! I love this cutting table so much I ran out and bought the cubbies and butcher block top right away. 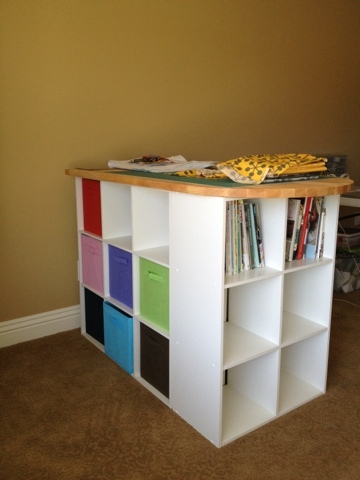 I am ready to put it all together in the sewing room and was wondering if you used and "L" brackets to secure the top to the cubbies? I am having a time trying to post a comment! Third time's the charm! Right? I love this cutting table so much I ran right out and bought all the components! 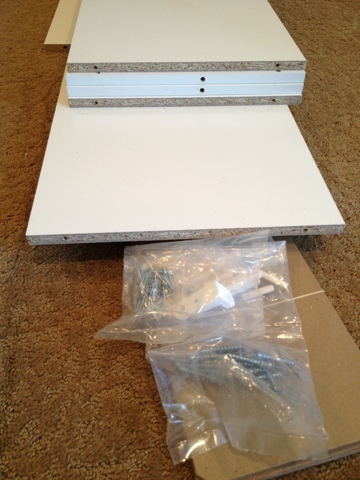 The cubbies are assembled and I am ready to put it all together in the sewing room. Did you fid it necessary to use "L" brackets or such to hold it all together for stability?